Acne rosacea is a chronic but treatable condition that primarily affects the central face, and is often characterized by flare-ups and remissions. It typically begins any time after age 30 and rosacea symptoms include flushing or redness on the cheeks, nose, chin or forehead that may come and go. 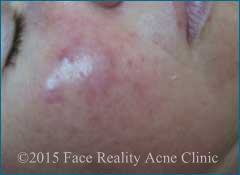 Over time, the redness tends to become ruddier and more persistent, and visible blood vessels may appear. Left untreated, bumps and pimples often develop, and in severe cases – particularly in men – the nose may grow swollen and bumpy from excess tissue. In many people the eyes are also affected, feeling irritated and appearing watery or bloodshot. Rosacea can affect all segments of the population. Individuals with fair skin who tend to flush or blush easily are believed to be at greatest risk. The disorder is more frequently diagnosed in women, but tends to be more severe in men. There is also evidence that rosacea may tend to run in families, and may be especially prevalent in people of Northern or Eastern European descent. In some cases of rosacea, there is a proliferation of demodex mites. They implant themselves into the wall of the hair follicle and make the skin swollen and red. It is pretty obvious that you can’t avoid all of the triggers and still have a life. While there is no cure for rosacea skin; we have a treatment and home care regimen for rosacea that works incredibly well for those with a papulopustular rosacea (subtype 2). We have been having a lot of success getting rosacea under control, often times with only 2 or 3 treatments within 4 to 6 weeks. You will need to spend five minutes each morning and night, applying a few reasonably priced home care products to your face. This is a small price to pay when you consider the alternatives. If you have tried other remedies for rosacea without success, our rosacea treatment may be the answer for you.